I smash one of Prey’s many mugs with my hefty wrench. And then another. Dead mugs everywhere. I’m on a roll, so I throw a box at a lamp, shoot a chair and knock over a bin. I hold my breath as I murder every inanimate object I can see. But it’s the one thing I don’t notice, a small beaker in a dark corner of a shelf, that proves to be my undoing. It flies across the room and transforms into a hideous alien spider before leaping at my face. I run, not for the first time or the last, for my life. 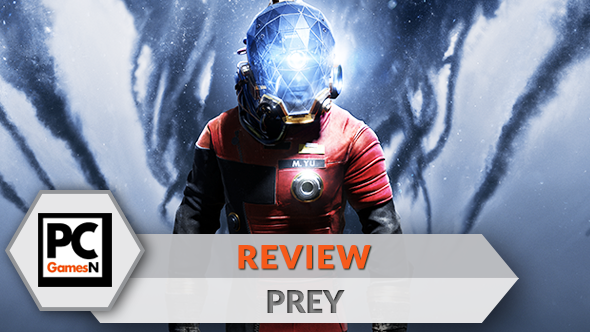 Read more: check out our PC performance analysis of Prey. These Mimics are the first aliens, known as the Typhon, that you’ll encounter in your trek through Talos I, Prey’s vast, single location. Along with an introductory twist, they drive home the most important of the game’s themes: nothing is as it seems. Almost every room, weapon and ability reinforces this all-important message, not only informing the tone of the game, but how you’ll interact with it. As you guide protagonist and scientist (protagientist?) 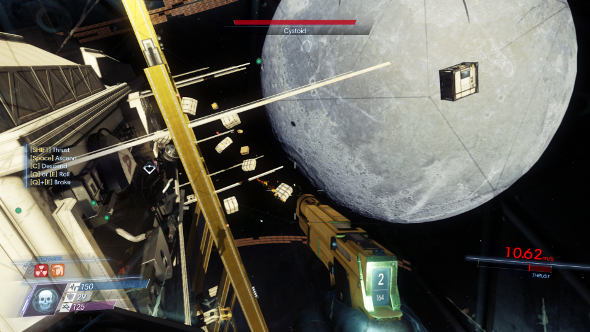 Morgan Yu through the increasingly dangerous space station, developer Arkane takes a back seat and lets you make all the calls, from the big decisions, like which direction to take, to moment-to-moment stuff, like how to tackle your most common adversary: a locked door. Say the door requires a keycard to enter. You don’t have it. Obviously you need to find the keycard then, right? That’s one way to do it, certainly. Maybe you’ll hit up a security terminal, search for an employee that’s likely to have the item, then go on a potentially perilous journey to hunt them down. Perhaps they’re dead, so you’re looking for their corpse. Maybe they’ve been transformed into a Typhon and you’ll have to fight them. Look closer, though. Is there a small gap in the barred window near the locked door? 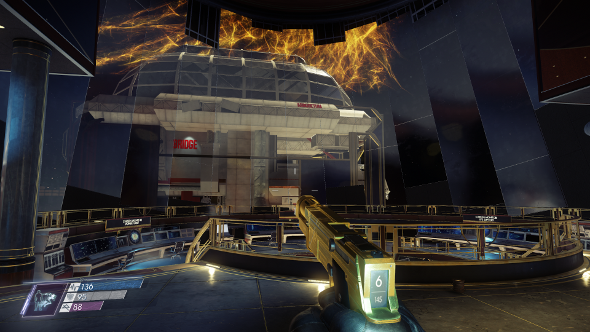 If you can see a terminal with an unlock button, you might be able to fire projectile at it. If you’ve research the powers of Mimics, you could transform into a mug and just jump through. Is there something you can hack? Blow up? A way to get in from above or below? Every locked door is a puzzle bursting with potential solutions. Experimenting with the game’s systems, testing weird theories – that’s how you’ll get through Talos I alive. 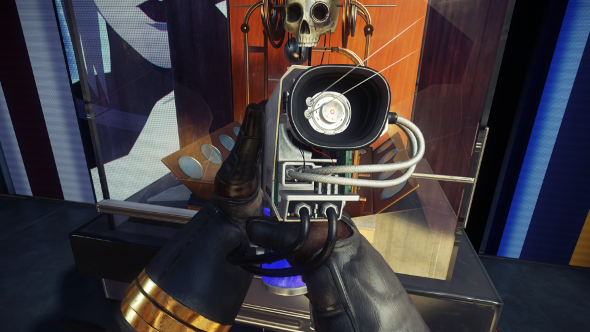 It’s impressive how well Prey trains you to look at the world like this, and it’s mostly done subtly, by showing rather than telling. New uses for weapons, like the handy multi-purpose GLOO gun, are revealed by the environment rather than a tutorial or an NPC. 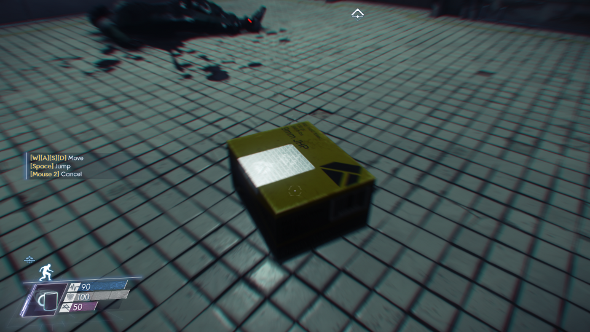 At first it’s just a way to temporarily stop enemies in their tracks, encasing them in a quick-hardening glue, but it’s really one of the most important tools in the game, clearing up hazards and opening up new ways to navigate the station. Talos I itself is expertly designed, a stunning floating city that feels equally like a work of art and a brilliant piece of engineering. It’s a huge, interconnected machine, with rooms linked together by massive anti-gravity tubes, maintenance ducts and walkways, and just when you think you might be stuck, there’s always something, like an airlock, that allows you to take a shortcut, even if it’s out into the void of space. Backtracking is, lamentably, a requirement, and there’s nothing more dispiriting than going through four loadscreens only to be told you have to back through them all again after just reaching your destination. By ignoring the critical path, however, you can spend more time investigating these areas, and when you hit them a second time, you’ll probably have new keycards, codes or powers that will allow you to explore them in greater depth. They change, too, filling up with new characters, obstacles and enemies. Unfortunately, almost all foes have one speed: attack, attack, attack. They see you and then they try to kill you, and there’s nothing more to it than that. They don’t work together, and they aren’t reactive in the way that Dishonored 2’s foes are, nor do they feel like they’re part of an ecology or hierarchy. So opportunities for manipulating them and getting really creative in combat are significantly rarer than in Arkane’s last game. Only the Mimics deviate from this by behaving like animals. They wait before they strike, and they hide and flee when they’re in danger, like there’s a primitive intelligence beneath their gooey, black exterior. However! They’re challenging. There’s a wealth of variety, and each fight – particularly early on – is a puzzling encounter. Every enemy type must be taken on in a different way, depending on their weaknesses to specific weapons, the environment they reside in, and what powers they use. You’ll want to hide from the giant, stalking Nightmares; keep your distance from the teleporting Phantoms; knock out robots with EMP grenades and electric abilities; and generally do your homework. Watching them. Scanning them. There are plenty of nifty gadgets, powers and weapons that make battles feel more novel, too. Standard guns, like the shotgun and the silenced pistol lack weight or punch, and Morgan is definitely not a fighter, but he has a big bag of tricks. I’ve become quite the fan of grenades that recycle everything in their blast radius, breaking down synthetic and organic enemies and objects into their base components, perfect if you fancy doing a spot of crafting afterwards. Eventually, you’ll get inhuman skills, allowing you to summon your very own Phantoms, take control of machines, and rip them off the ground with telekinesis. New abilities come with a cost, however. Mundane stuff, improving your gun-handling skills, lifting heavy objects and getting more stamina are fine, but when you start injecting yourself with alien DNA, there are consequences. You’re making Morgan less human, you see, and the station’s automated security is, you’ve guessed it, programmed to kill aliens. If, like me, you’re a fan of picking up turrets and plonking them down wherever you fight – less like a scientist and more like Overwatch’s Torbjorn – this creates a bit of an issue, since your mechanical pals are now intent on killing you. So you’ve got to sneak up on them and do a spot of hacking before they’ll chill out and lend a hand again. When all else fails, you can always just pick up chairs, boxes and ashtrays and toss them at surprised foes. A ceramic dish full of cigar ash is a surprisingly decent weapon, in a pinch, but can also serve as a distraction if you’d rather avoid getting set on fire or having your face torn off. 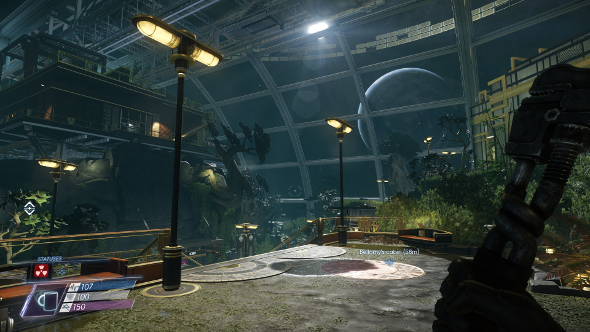 Speaking of bludgeoning aliens with ashtrays, Prey’s tone is one of its biggest surprises. It’s absolutely not a horror game. It makes a few sophomoric attempts at horror, sure, with poorly-timed jump scares and PG-13 gore, but it’s more of a thriller with a big dose of wackiness, where you can turn into a pizza box one minute and get unnerved by the paranoia-inducing string and otherworldly synth soundtrack the next. And throughout, you’re questioning the nature of your reality and everyone’s motives. But while you’re doing this, don’t expect a peep out of stoic Morgan. Morgan is, bizarrely, mute. You’ll hear his or her voice in recordings and videos and see their words in emails, but that’s it. Other characters will chat away as if you’re having a conversation, making it all the more unusual, and it reaches its bizarro peak when you’re having heart to hearts with family members and old friends but never utter a single syllable. It’s a particular shame because it’s a game with lots of well-developed characters. Prey uses an incredibly tired system to tell unexpectedly compelling stories. You’ll be reading a lot of emails and listening to a great many audio logs, but it is entirely worth it. Even dead members of Talos I’s crew get proper arcs, including a touching but tragic romance. There are a lot of corpses on the station, so many that they threaten to become perfectly normal, but they’re not just slabs of rotting meat. They’re people I care about, respect, and yes, sometimes greatly dislike, who I only learned about after their unfortunate demise. Discovering these friendships and grudges through messages and environmental storytelling brings the dying station to life. Connecting with the crew also blesses the side quests and even combat encounters with a greater impact. Some of the Typhon have mind control powers – because aliens – and I vividly recall the first time I was forced to fight a group of my fellow humans. I had no idea if I could avoid harming them, but I went out of my way to keep them safe, anyway, using no area-of-effect attacks, sneaking past them, trying to focus on the beastie commanding them. I was elated when I managed to win the fight with no human casualties. I knocked them out and then hid them somewhere safe. It turns out that this is part of the game’s unspoken morality system. Other moral choices are more overt: saving a one-time enemy. Rushing to rescue a group of suffocating survivors. And, of course, the main quest itself, where you’ve got to decide the fate of the station, a task you’re given right from the get-go. The dire situation means that most missions you accept or ignore feel like they have some sort of karmic impact, even if it’s not outright expressed while you’re doing it. It’s not a matter of scoring points, there’s no moral indicator and no XP – you help people because you want to. 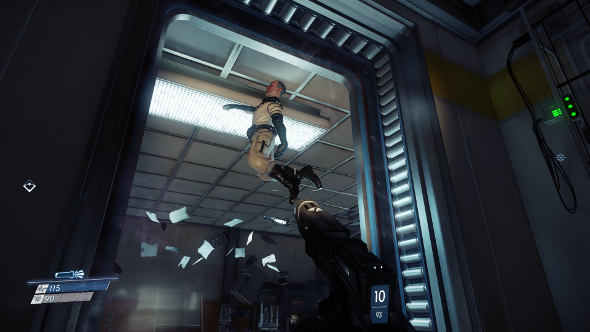 For most of the experience, Prey eschews the gamification of morality that’s so horribly present in the medium, and it makes these choices more meaningful, even though they’re still largely binary. By the end, Prey flings everything at you, losing a lot of its nuance along the way. And when there are no more nooks and crannies left to explore, just lots of enemies to fight, its magic evaporates a little bit. Slow, methodical exploration is where it shines, and thankfully that’s still the bulk of the game. It’s weird, clever and Talos I is undoubtedly going to be high up in my list of best game locations. It’s not quite the revelation that Dishonored 2 was, lacking its precise combat and reactive foes, but it doesn’t have any of its performance problems either. It’s more likely to be compared to BioShock and System Shock 2, of course, but Prey can stand on its own. A lot of the design philosophy might be familiar, but it’s that first lesson introduced by the Mimics – nothing is as it seems – that truly defines it. It’s a game of surprises and lies, with fake endings and fake mugs. You shouldn’t trust it, but it absolutely trusts you and your wits to find your own solutions to its myriad conundrums and obstacles.